Just discovered your website on the Midlands coal Industry today. Absolutely amazing so much to read so much to understand and the memories now making a little more sense. Spent an hour reading today from my home in Jakarta and will spend many more hours doing the same. I originate from Selston and my family and school friends have worked down numerous collieries in the area but mainly Langton, Bentinck, Calverton and Pye Hill. My uncle was the late Jimmy Wright who I believe was the Chief Mining Engineer at one point around 1970. I can not thank you enough for making all this information available. PS just wish I could say " Long Live King Coal "
When I started work as an Apprentice Surveyor at Teversal in 1953 Jimmy Wright was the Manager 1952-1954. He had moved there from Cotes Park where he was Manager from 1950-1952, previously to that he was Manager at South Normanton (Winterbank) 1947/48-1950. He was small in stature as you probably know but made up for it in shrewdness. If I remember right he always drove Jaguar cars and peered through the steering wheel. He used to give me a cigarette from a packet of Players that was always open on his desk, that is when I went to fetch his plans folder to make the workings up to date every week. If I was lucky and he was in a good mood he would give me another when I took the folder back for him to peruse. He said that he got the cigarettes from Reps who called to sell various mining equipment. I suppose it was a sweetener and a way of getting him to buy. He never seemed to find us any other jobs to do and left us to do surveying. He started work at Bentinck aged 14 as a pony driver and left about 18 to Bull & Butcher pit (New Selston) so that he could work on the coal face and study at the same time. He obtained his Undermanager's 2nd class certificate when he was 23 and his 1st class Manager's certificate when he was 25. He had a spell as a shotfirer and deputy and then went temporary as an Undermanager for a short period as he became a 'run about' for James Oakes & Co sorting out problems in their group of pits up until Nationalisation 1st January 1947. He was promoted from Teversal to Kirkby Summit colliery 1954-1956 and promoted again to Group Manager for Annesley, Newstead and Kirkby 1956-1958. He was Deputy Chief Mining Engineer at No4 Area, Huthwaite from 1958 then Eastwood No5 Area when swapped with Jim Stone in 1964. When the NCB was reorganised in 1967 he was Chief Mining Engineer for South Notts, then promoted to Deputy Director for South Notts Area at Bestwood in 1973, a position he retired from aged 60 in 1977, after 45 years in the industry. He reckoned that because they wanted him to go as Deputy Director to North Derbyshire earlier, and he refused, it cost him a Director’s job. I met him at George Noble's funeral (a later Manager at Cotes Park and Teversal) and we sat together at the wake and reminisced of times gone by. That is why I know so much about him. He went to Cotes Park because there was a house with the job, instead of stopping at Winterbank where he had doubled the output, he said. However that pit was to close about a year later. He moved to the Grange in Teversal village when he was Manager at Teversal and then to a house opposite Sutton Baths when at Kirkby and Group and then to the large green roofed house, Green Gables? at Alfreton, leading to Oakerthorpe, not far from the golf course. It was later a 'Cheshire home' for disabled. He always looked smart, full head of hair combed back (like the Brylcream look). He died aged 94. in 2011. 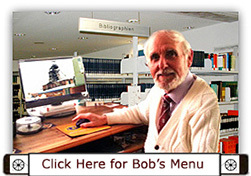 I found your website via google – most interesting. While researching my extended family I have found a distant cousin Frederick Herbert Shaw whose death details state he was killed at the pit on November 9th 1940. However his name doesn’t appear. Do you have any information on this accident and Frederick please? Not found anything in Nottingham. Marilyn could visit or phone Mansfield Library and check newspapers around that date nothing in Nottingham Post. Hi I sent you a message last week on your website. I found something when I was out metal detecting in Mapperley. It is a pit motty belonging to a Mr Howitt. I’m looking to return it to the Howitt family. Can you help please? Thank you. 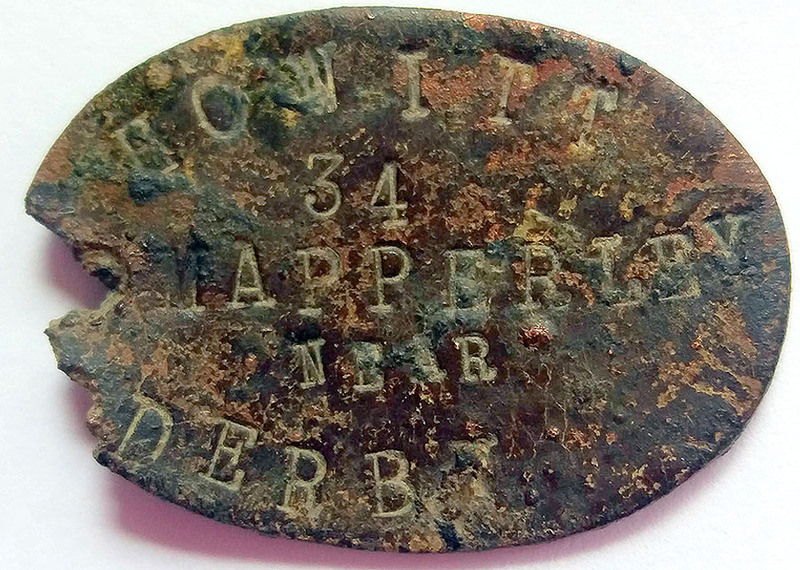 The Motty (Token, Mottee or Mottie) is an identity tag, at the start of his shift the miner would collect it, with his lamp, then give it to the Banksman when he went down the pit, later he would hand it back to the Banksman when he came out. If it was not handed in a search would be organised. I believe Book 5-1968, Page 11 contains an error. 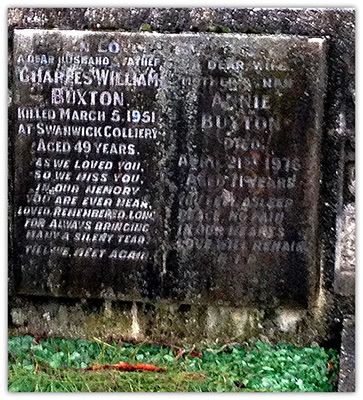 My grandfather, William Charles Buxton is reported to have died in a pit accident at Swanwick Colliery on 5th March 1956 but I have a photo of his headstone in Alfreton cemetery giving the date as 5 Mar 1951. 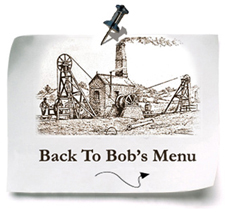 I have found your website a fascinating source of mining history and facts. the firms that the coal produced is used by. Also what has happened to the planning application for a surface mine at Shortwood Farm at Trowell, has this now been abandoned since the demise of UK Coal. The drift mine at Eckington, close to the River Rother on Rotherside Road, is still working and produces coal from the Flockton (or Deep Soft) seam. The coal is worked in 3 headings and cut down using a small Alpine boom cutter loader and cross cuts are made leaving square pillars of coal. The coal is scooped up using a Bobcat rubber-tyred machine with a front bucket and loaded onto the main conveyor that takes the coal up the 1in3 access roadway and over the River to the screen where it is stacked. Wooden leg supports with steel cross girders are used. The mine was closed for a period in 2014 when problems arose over non payment of income tax out of the men's wages. The 27 men who worked there men assumed they had paid the correct rate of tax but each got a demand for back taxes from the Inland Revenue. It transpired that the owner and manager had not stopped the tax out of the wages. He was taken to Court and sentenced to 4 years in jail. He had been in trouble with running a business some time previously. The mine was re-opened by another firm, European Coal Products Ltd. I am not sure of the weekly output at present but when I visited the mine getting on for 3 years ago the output of around 600 tonnes was sent by road to a Trent side power station. The Director of the firm is Colin Stocks previously an ex Manager for British Coal at Blidworth and Cotgrave and Deputy is Dave Cawthorne. Regarding the Shortwood Farm proposed opencast site. Permission has been granted to work the site but as yet remains untouched, I should imagine until the Smalley site is completed. I am looking for the details of any involvement by the Langley family i.e. Butterfly Iron and Coal, in particular John Langley and Samuel Langley and maybe Samuels son Williamson Langley, nephew Harold Langley. I would so, so appreciate details, I am looking for confirmation that they were partners in the company (Langley family). Benjamin Outram And The Butterley Co., Benjamin Outram and Co was formed in 1790. The partners were Benjamin Outram (1764-1803), born Alfreton, Francis Beresford, Solicitor (1737-1801), John Wright (1758-1840) Banker, and William Jessop (1745-1814) Engineer. The firm established an ironworks and bought the freehold of the Butterley Hall Estate in 1790 from the Horne family and began developing the ancient coal and ironstone workings. Benjamin’s father Joseph was born at Alfreton in 1732. The Butterley Company was formed in April 1791. The new company paid 8 sinkers up to 2s 3d (11¼p) a day and 5 labourers 2s (10p) a day. In 1829 Langley Pit (Butterley Co) (North Derbyshire) commenced work. A Langley Mill Work opened in 1874 at the top of Bridge Street, in Langley Mill but that was an Engineering Company and was opened by G R Turner and sons.